On Tuesday, May 7, German Ambassador Peter Ammon hosted the opening of a new Leo Baeck Institute exhibition at his residence. 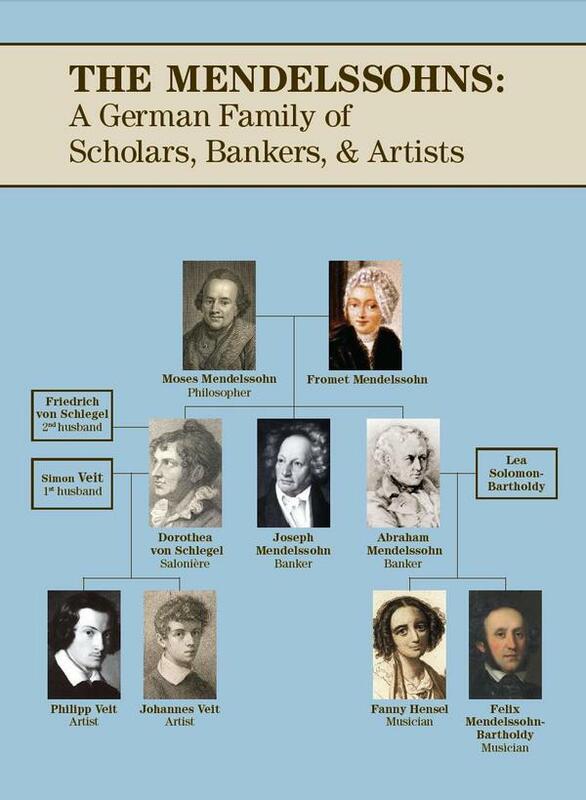 “The Mendelssohns: A German Family of Scholars, Bankers, and Artists” was curated by the Leo Baeck Institute (LBI) from its extensive collection of personal papers, books and other artifacts. The exhibit features key members of the famous Mendelssohn family. “Few families have had a more profound impact on the shaping of German culture than the Mendelssohns,” the Ambassador said at the opening. According to Rabbi Ronald B. Sobel, the President of the Leo Baeck Institute, one cannot understand the contributions of German Jewry to modern history without appreciating the brilliance of Moses Mendelssohn. In his remarks, Ambassador Ammon thanked the Leo Baeck Institute for continuing the tradition of sharing some of its vast archives for an exhibition in the Residence. 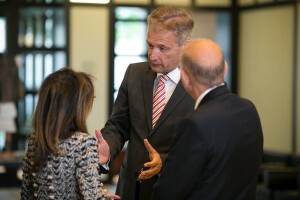 Carol Kahn Strauss, International Director of the Leo Baeck Institute, not only gave an outline of the exhibits, but also underscored the mission of the Leo Baeck Institute as the premier research library and archive devoted to documenting the remarkable history of the German-speaking Jewry. Guests were then treated to a piano concert featuring the music of Felix Mendelssohn Bartholdy and his sister, Fanny Hensel, presented by acclaimed pianist Sara Leila Sherman. A panel from the exhibition shows some descendants of Moses Mendelssohn. The philosopher and thinker Moses Mendelssohn sought to integrate Jews into German society in the Age of Enlightenment. He translated the Hebrew Pentateuch and other parts of the Bible into “High German” (instead of the Yiddish-German used by most Jews at the time), indirectly paving the way for the Reform movement. He and his wife Fromet had ten children, six of whom survived. 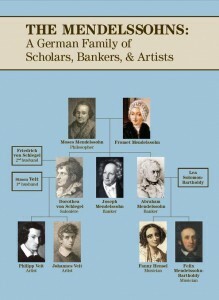 Of these we meet Joseph Mendelssohn and his brother Abraham, who founded the Mendelssohn Bank. The Bank operated for nearly 150 years and was one of the most important private banks in Germany, until it was forced to shut down in 1938. Abraham’s children Felix Mendelssohn Bartholdy and Fanny Hensel were influential not only within the Berlin music scene, but also on the European stage. While Felix became a household name during his lifetime, Fanny’s abundant musical contributions were forced to remain more private until many years later, when her music could be published under her name. Dorothea, a sister of Joseph and Abraham Mendelssohn, married the romantic writer and poet Friedrich von Schlegel. Both of her sons, Philipp and Johannes, became renowned Christian painters, members of the Nazarene movement.